Bill Gates is about the most mild-mannered and genuinely nice, um, unbelievably rich head of a multinational monolithic corporation that you could imagine. 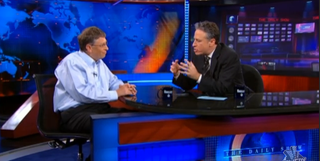 So why is Jon Stewart antagonizing him with anti-Zune and pro-iPhone barbs? Oh, right. Because it's funny. Warning: Clips are from Hulu, which means they're US-only. Sorry, foreigners, but, well: U-S-A! U-S-A! U-S-A!